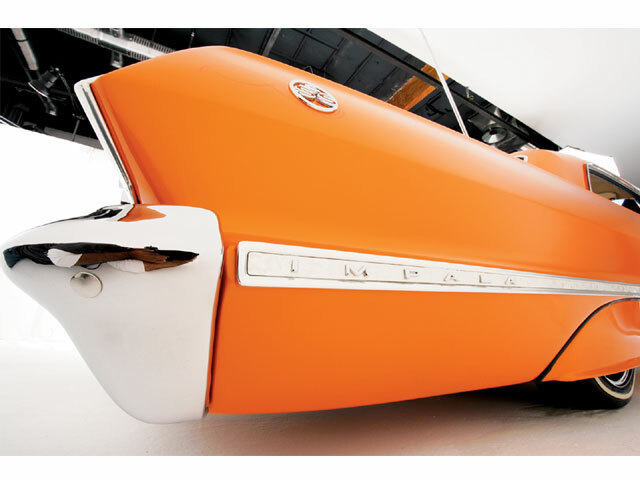 This Tasteful '63 SS From The Midwest Is One Of Our Current Favorite Flavors. When we spotted this bright orange ’63 Chevy Impala SS at last year’s Denver, Colorado, Lowrider Tour stop, we thought, “Wow, this car is done right.” Then we found out that the car actually blew in from the “Windy City” of Chicago, Illinois, and we thought, “Well, it looks like road-trip time.” Eddie Saldana’s Impala is one of the cleanest ’63s to hit the show circuit in a long time, with detail and quality to rival any of the big California cars, and we knew that it would be a strong representative for Rollerz Only Car Club. When Eddie began this project two years ago, he never thought that it would go this route. 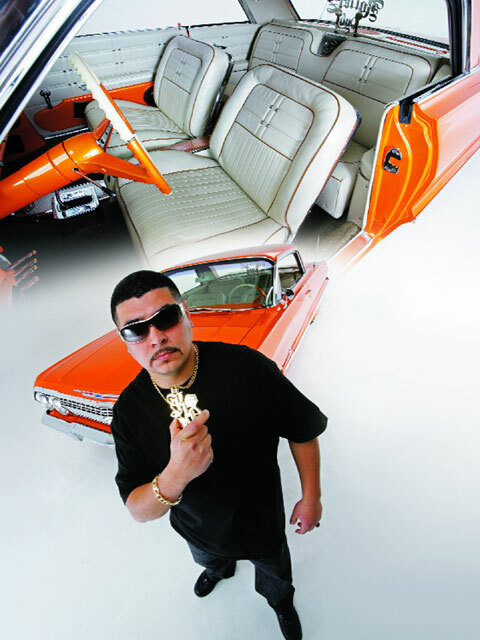 His Impala was supposed to be a hopper like his last creation, “The Hulk,” an ’86 Buick Regal that was featured in Lowrider three years ago. To get the ball rolling, Eddie decided to go see his buddy-Bob “Hollywood” Wagner at Hollywood Kustoms in Northlake, Illinois-who had built the Buick. 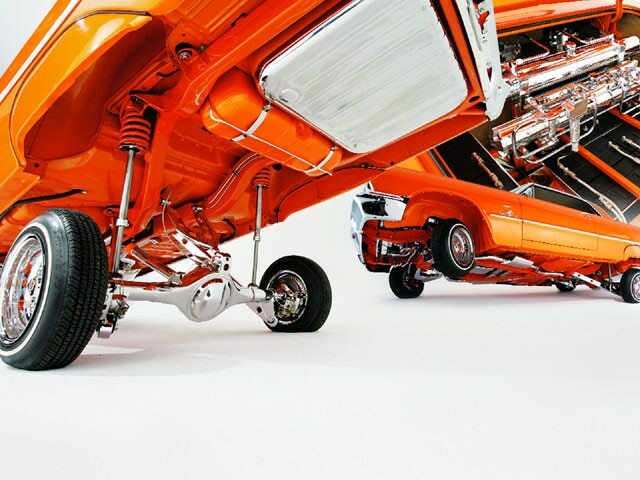 “I had a ’63 Impala that I brought to Bob at Hollywood Kustoms and when he first saw it he told me to not even bother taking it off of the flatbed,” says Eddie. “He said that all that I had was a ‘parts car.’ ” Eddie dropped a deposit and asked Bob to find him a new ’63. Bob made a few calls and a month later located this ’63 in a barn in Louisville, Kentucky. Bob brought the Kentucky ’63 to his shop in Illinois and let Eddie know that everything was cool and that he had a good starter car. Bob wasted no time on this project, taking the car completely apart and going through it. 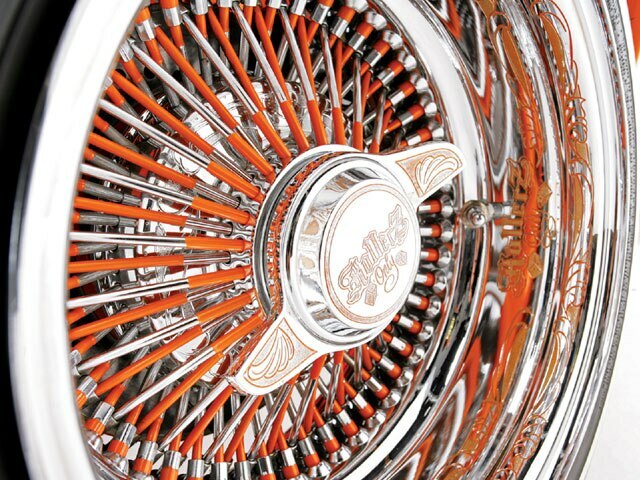 Since Hollywood Kustoms is known for hydraulic work, the frame was the first thing to be hooked up. 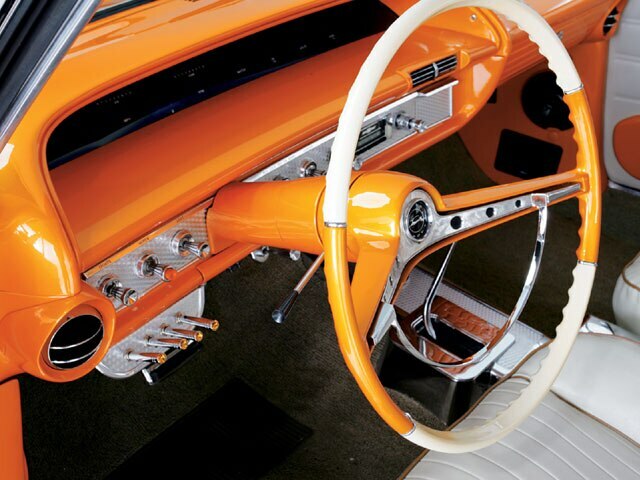 The rear of the frame was modified with a custom “wishbone” that centers the custom 9-inch Ford rearend housing. The rear trailing arms were also extended to allow the car to lock up high. The whole frame was wrapped and molded smooth by Bruce and Rudy, who help out at the shop. While the car off of the frame, Bob repaired the floorboards and then prepped and painted them in House of Kolor Sunset Pearl. The body was then put back on the frame and the rest of the body work was carried out. Weather’s a big part of life in the Midwest and Bob knew that he had a project for the winter. He took his time perfecting all of the body work and paint on the ’63, and added silver leaf and pinstriping. Bob moved to the engine compartment where an ’88 Chevy IROC 350-c.i.d. TPI engine and 700R transmission were wired up using a Painless wiring kit and a factory computer. The car has a “check engine” light incorporated into the Dakota Digital dash, as well as a scan tool connector like most modern day cars. The newer motor was plumbed and a custom cold air intake was created to give the compartment a cleaner look. Other tricks under the hood include a handmade polished stainless steel firewall, and tubular radiator hoses, heater hoses and motor mounts. The car also received a Billet Specialties serpentine kit and 605 gearbox for better control. To stop all of this new-found power, a set of disc brakes was bolted on. Bob is known for building high-quality show setups so when he jumped into the car’s trunk he knew what he had to do. The car now features four Hi-Low pumps, four Adex dumps and two whammy tanks. The aluminum center pressure and side return blocks were hard-lined in stainless steel and power is provided by 14 batteries covered with stainless steel polished panels. A pair of 8-inch cylinders are used up front and a set of telescoping 38-inch cylinders in the rear allow the car to lock and lay and do some popular moves like three-wheel motion. Eddie’s “Sabroso” ’63 was put together in little more than a year and could not have been completed without the help of Hollywood Kustoms and the support of Eddie’s family, including his wife, Letty, son Adam and daughter Nylah. 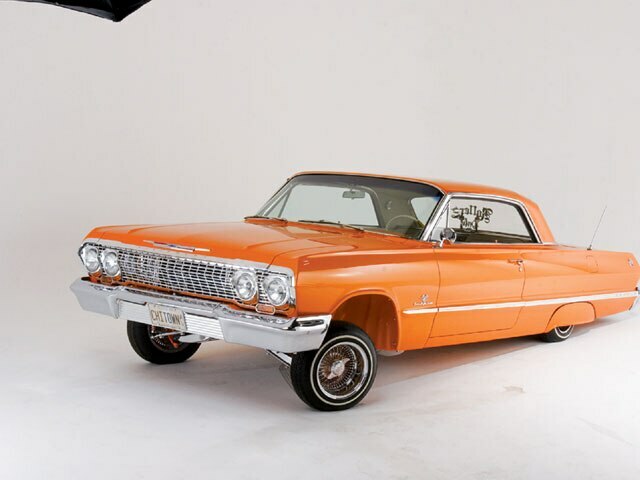 This ‘flavorful” Impala project definitely took the route that lowriding needs to go-clean frame-off custom “drivers.” Eddie tells us that he has another project in the works and that he’ll be using Hollywood Kustoms for that car as well. Hey, why mess up a beautiful relationship? 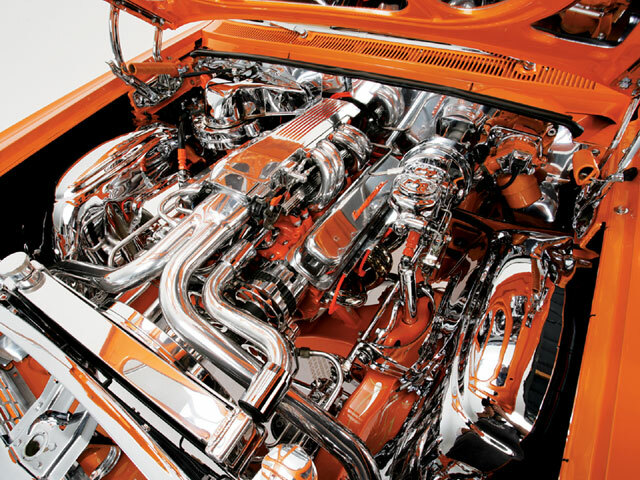 Engine/Drivetrain: Bob at Hollywood Kustoms in Northlake, Illinois, installed an ’88 Chevy IROC 350-c.i.d. TPI engine and 700R transmission. The new engine was plumbed and wired up using a Painless wiring kit and a factory computer. Tricks include a Billet Specialties serpentine kit, custom cold air intake, and tubular radiator hoses, heater hoses and motor mounts. Body/Paint: Bob at Hollywood Kustoms used House of Kolor Sunset Pearl as the principal color throughout the car, with silver leaf and pinstriping added later. 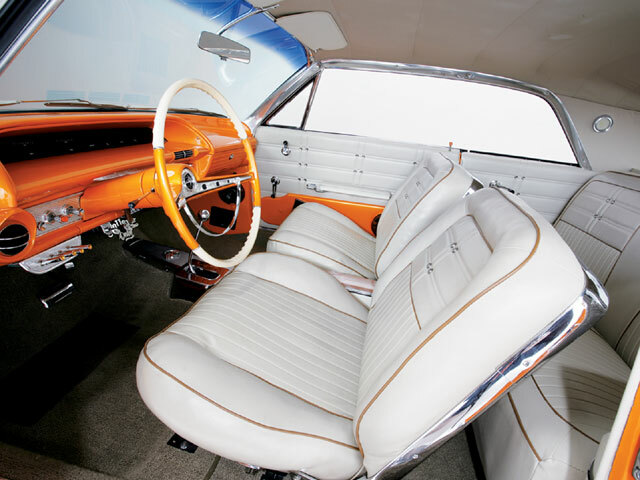 Interior: Hollywood Kustoms is a one-stop shop and Bob and Rudy came through with an oyster-colored interior with saddle piping. Sound System: The car was sent out to X-Envy Audio in West Chicago, Illinois, where they installed a Myron & Davis head unit, Kenwood amplifiers, Kenwood midrange speakers and 12-inch Infinity subs. Setup: Bob at Hollywood Kustoms is known for building high-quality show setups and this car now features four Hi-Low pumps, four Adex dumps and two whammy tanks. The aluminum center pressure and side return blocks were hard-lined in stainless steel and power is provided by 14 batteries covered with stainless steel polished panels. A pair of 8-inch cylinders are used up front and a set of telescoping 38-inch cylinders in the rear allow the car to lock and lay and do some popular moves like three-wheel motion.